Recently, Hannover-Messe (Hanover Fair) 2019 came to an end in Germany. Started in 1947, the Hanover Fair is known as the world's largest industrial fair. At this year's Hanover Fair, four high-tech companies from Foshan including Jaten Robotics, KEDA, Flexiv Robotics and Sheng Ye participated in the fair. “Intelligent manufacturing in Foshan” has become the new force of “Intelligent manufacturing in China” and appeared in the world's top industrial event. It is the first time for Flexiv Robotics, a hi-tech enterprise from Nanhai, to participated in the Hanover Fair. The founding team members of the company are very young, mostly from the world's top universities and artificial intelligence laboratories such as Stanford University and Berkeley University. Wang Shiquan, CEO of Flexiv Robotics, said that their technical team had secretly developed for three years before exhibiting the next generation of adaptive robot technology for the first time at the Hanover Fair this year. On April 1st, German time, Jaten Robotics from Shunde, Foshan, released its own Heart-beat System, which is a milestone in the development of multi-robot management system. 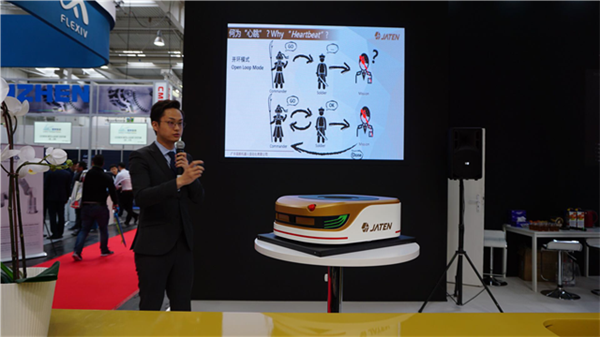 For the first time, Jaten Robotics implanted the “heart” module in the storage robot, which will greatly improve the stability of the intelligent storage system. 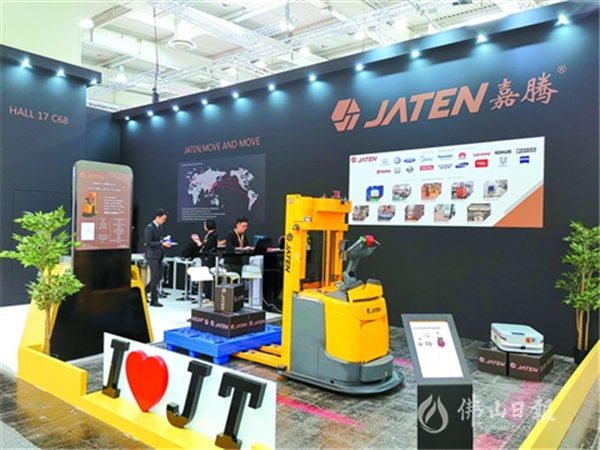 In addition to the world's first Heart-beat System, Jaten Robotics also brought the new laser forklift AGV, the "small ant" and the industrial intelligent software to Hanover Industrial Fair this year. Chen You, chairman of Jaten Robotics, said that the platform of Sino-German Industrial Alliance platform has benefited Jaten Robotics a lot. The cooperation between Jaten Robotics and RWTH Aachen University in Germany has produced fruitful results. In the second half of last year, RWTH Aachen University sent many top experts to the Jaten Robotics for the diagnosis of intelligent manufacturing, and gave a lot of help and guidance. It is known that the other two Foshan enterprises also exhibited their new products. KEDA exhibited intelligent and customized automotive aluminum wheel forging production line. Sheng Ye exhibited low-voltage power quality comprehensive treatment products.